If you haven’t had PB2 yet, then you are missing out! It’s one of the best tasting peanut butters I have ever had! I love how I can easily use it for baking, on-the-go and of course….in shakes and smoothies. I’ve been buying the stuff constantly since I first discovered it. 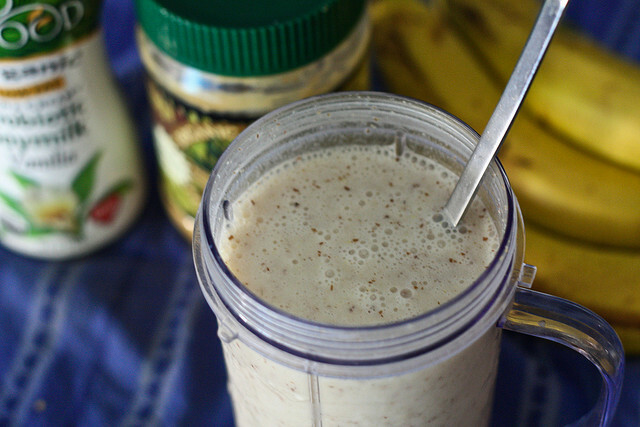 Regular peanut butter is so messy and tough to blend properly into a protein shake. A protein shake with PB2 is the total opposite. It blends up well and has all of the flavor of roasted peanuts — as well as the nutritional value. I’ve been coming up with different PB2 protein shake recipes for a while and this has long been one of my favorites. It has only a few simple ingredients and there are tons of ways you can customize it to your taste preference or macro nutrient needs. All I do is add all the ingredients into the blender and then enjoy! You can also get adventurous and use chocolate PB2 instead or try dark chocolate almond milk as well. Make this one your own and enjoy the easy blending of PB2!